The role of prison chaplains is to meet the religious needs of inmates. But the specific activities of prison chaplains vary from state to state and facility to facility. Most chaplains report that they perform a wide range of functions — from administering religious programs, to training volunteers, to advising other prison staff members. In the view of many chaplains, however, their most important role is to personally lead religious services, provide religious education and counsel inmates. Some seem to chafe under the burden of paperwork and administrative duties. But, on the whole, they express high levels of job satisfaction. 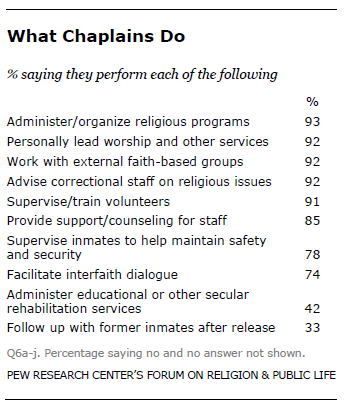 The Pew Forum survey asked the chaplains which of 10 possible functions they perform as part of their work. The chaplains could indicate that they perform multiple functions, and virtually all of them did so. Indeed, more than nine-in-ten say they do each of the following: administer religious programs (93%), work with external faith-based and community organizations (92%), personally lead worship services, religious instruction or spiritual counseling (92%), advise correctional staff on religious issues and related policies (92%), and supervise or train volunteers (91%). A majority of chaplains also say they provide support and counseling for correctional staff (85%), supervise inmates to help maintain security (78%) and facilitate interfaith dialogue among inmates or staff (74%). A substantial minority (42%) of chaplains say they administer educational or other secular rehabilitation services as part of their job. And a third (33%) say that following up with inmates after release is among their duties. An open-ended question on the survey asked chaplains to list any other activities on which they spend “a significant amount of time” on the job. One response was particularly common: paperwork. Among those offering a response, 45% mentioned administrative tasks such as completing paperwork or processing religious accommodation requests. Other frequent responses include communication with family members of inmates and to inmates regarding family news (cited by 18% of respondents to the open-ended question), pastoral counseling (17%) and recruiting and vetting volunteers and in-kind donations (16%). 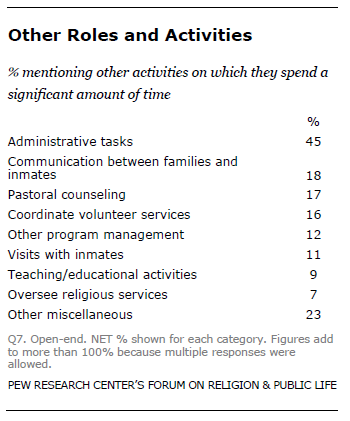 Asked to rank the top three activities on which they spend the most time, the most common response from chaplains was serving as an administrator helping to organize religious programs. Nearly seven-in-ten chaplains rank this among their top three activities on the job (69%), including 38% who say it is the activity on which they spend the most time. About the same portion (66%) reports that personally leading worship services, religious instruction or spiritual counseling sessions is among their top three activities, including 33% who say it is how they spend the most time. Other activities are less central to the chaplains as a whole. About one-third of chaplains (32%) say that supervising or training volunteers is among the top three activities they perform. 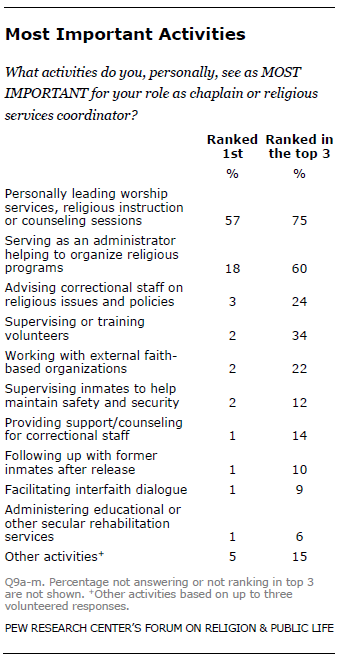 About a quarter (24%) rank supervising inmates in their top three activities, and about a fifth (19%) consider advising correctional staff on religious issues one of their top three activities. Fewer than one-in-ten say that providing counseling for staff, administering secular rehabilitation services, facilitating interfaith dialogue among inmates or staff, and following up with inmates after release are each among the top three uses of their time on the job. Time-consuming activities do not always match up with priorities for the job. The Pew Forum survey also asked each chaplain to rank the top three activities that, from his or her point of view, are most important. One activity stands out: personally leading worship services, religious instruction sessions or spiritual counseling sessions. About three-quarters of the chaplains surveyed (75%) consider this to be among their most important functions, including 57% who ranked it as their No. 1 priority. A majority of chaplains (60%) also view the administration of religious programs as one of the three most important activities they perform; 18% consider it their most important activity. Other activities were less likely to be seen as high priorities. A third of chaplains (34%) say that supervising or training volunteers is among their three most important duties. 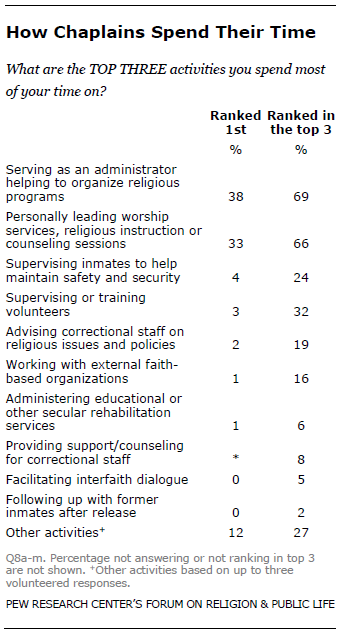 About a quarter (24%) say that advising correctional staff on religious issues and related policies is one of their top priorities; a similar portion (22%) says the same about working with external faith-based organizations. Despite some concerns about paperwork and some mismatch between what they think is most important and how they spend their time on the job, the chaplains surveyed report high levels of job satisfaction. 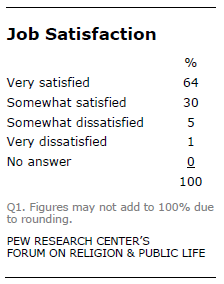 Six-in-ten say they are very satisfied (64%) and three-in-ten (30%) are somewhat satisfied, while just 6% say they are very or somewhat dissatisfied.